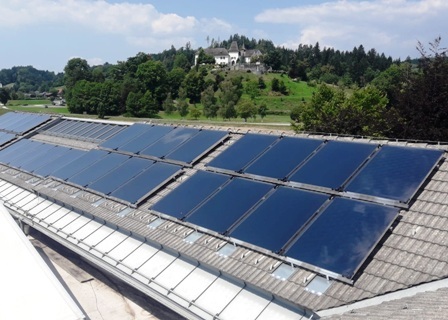 Newly founded SWA Solar Wärme Austria is offering solar heat supply to hotels, sports centres, car washes and manufacturing companies. Clients pay individually agreed-on rates, which are up to 20 % lower than current prices and are guaranteed for 20 years. SWA provides a “carefree heat supply package”, with the company financing, installing, operating and monitoring a solar thermal system. According to Managing Director Birgit Rutter, SWA’s first system with 77.5 m² of collector area had come online at a golf club in Klagenfurt-Seltenheim, Austria, a few days ago (see photo). Computer simulations had shown an annual solar yield of 48,000 kWh. The new venture has the backing of long-time solar thermal professional Robert Kanduth, who owns the majority stake in SWA. Kanduth is the founder of Greenonetec, a collector manufacturer that has been in business for over 25 years and has turned into the biggest in Europe. Co-owner Rutter has 15 years’ experience in managerial roles at Klagenfurt’s public utilities. She also took over management of Austrian installation business MySolar in March before co-founding SWA in June. The new company has since entered into partnership with both Greenonetec and MySolar. While the former supplies the collectors, the latter acts as planner, installer and operator. “SWA is a personal investment. I believe that heat supply contracts are a great way to get commercial clients to warm to green heat,” said Kanduth. ESCOs, or energy supply companies, possess several advantages for large heat consumers from the tourism, housing and manufacturing sectors. Customers pay only for what they use, and the heat price remains where it is for a long time. Every system has a monitoring unit for remote control. Additionally, heat output will become part of green marketing, with messages such as the following displayed at hotels or campsites: “Thanks to our solar system, 50 guests could shower today while keeping our carbon footprint down.” Usually, SWA seeks to retain ownership of a solar system until the contract has ended. Asset transfer can be negotiated with the customer thereafter. Rutter’s aim is to sign about 20 agreements this year. She runs the company alone and negotiates the heat supply contracts, while MySolar oversees technical implementation. MySolar’s product portfolio includes complete heating systems as well as individual solar fields. SWA has so far been supplying heat to customers in Austria. But in the long run, the company intends to take its business model to neighbouring countries, such as Croatia, Germany and Italy. There are very few requirements which commercial customers have to fulfil to benefit from an ESCO. These are enough roof space or grassland to install a solar field and a minimum annual heat demand of 50,000 kWh, which can be met by 75 m² to 80 m² of collector area.